Oil prices are up, but oil stocks aren't. That's why investors should take a look at Diamondback Energy, ExxonMobil, and Transocean. Here's something crazy to consider. In 2017, the average price per barrel of Brent crude oil -- the international benchmark price -- is up more than 15%. At the same time, though, the oil and gas industry as a whole is one of the worst-performing sectors this year. If that sounds odd to you, you aren't the only one. While there are some reasons this may be the case -- domestic crude prices are only up 6% over the same time frame -- it is still hard to imagine that the industry as a whole would suffer when the price of its most precious commodity has risen so much. With this in mind, it seems like it's a good time for investors to start digging into the oil and gas industry for possible stock ideas. So, we asked three of our investing contributors which stocks they like right now. Here's why they picked Diamondback Energy (NASDAQ:FANG), ExxonMobil (NYSE:XOM), and Transocean (NYSE:RIG). Sean O'Reilly (Diamondback Energy): What a difference a year makes. Last Thanksgiving, OPEC finally relented and cut production in an attempt to balance the oil market. The cartel even moved to extend production cuts through the end of 2018. This landmark reversal, made in partnership with Russia, marks a tectonic shift. The sun may be about to shine on the oil industry once again. And that makes hyperefficient oil companies like Diamondback Energy compelling investments today. Diamondback is one of the major players in the Permian Basin of West Texas. This particularly fertile geologic basin has been a favorite of the oil industry. Its proximity to the Port of Houston, and its bountiful, low-cost reserves, make it "ground zero" of the shale revolution. Diamondback is not only one of the most prominent owners of oil leases there, but is one of the lowest-cost producers. Over the past three years, Diamondback has cut its cash operating expenses per barrel of production by over 35%. On average, it can now produce a barrel of oil for less than $9. Diamondback Energy will be one of the biggest beneficiaries of an oil rebound. While many have been selling assets and cutting costs to survive, Diamondback has used the past four years to expand. It has done so by buying up assets and focusing on reducing costs; Diamondback could not have managed the energy downturn of the last four years any better. 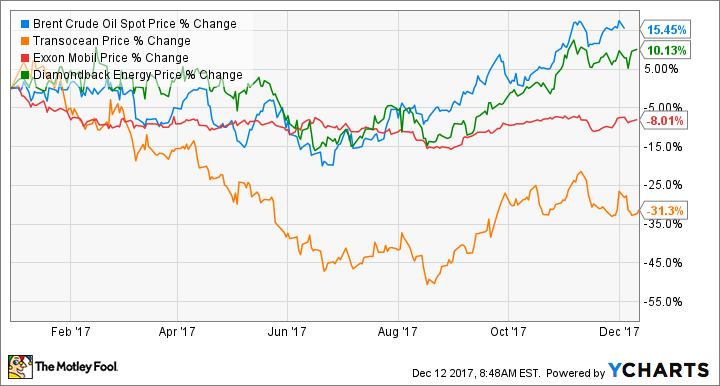 With its stock at just 18 times forward earnings estimates, and with industry-leading efficiency, Diamondback Energy is a fantastic oil stock to buy this December. Reuben Gregg Brewer (ExxonMobil Corporation): Shares of integrated energy giant Exxon are down around 7% so far this year. Many of its peers, on the other hand, are up for the year, some in the low double digits. But it's not like Exxon is suddenly struggling. In fact, it's doing just fine, with third-quarter earnings of $0.93 a share. But that's really par for the course; while many of Exxon's competitors were bleeding red ink during the oil downturn, this industry giant remained in the black. Now that oil prices have risen from their lows to above the $50-per-barrel level, Exxon looks like it's being left behind. However, there have been no material fundamental changes at the company, and investors seem to be overlooking growth opportunities like its efforts in the Permian Basin and offshore Guyana. In fact, at this point, Exxon is trading near its lowest ratio of price to tangible net worth in roughly a decade. Meanwhile, Exxon was one of the few oil companies to manage through the energy downturn with its streak of annual dividend increases intact (it's now up to 35 years). It also maintains one of the least leveraged balance sheets, with long-term debt at just 12% (or so) of the capital structure. And while peers are starting to close the gap with regard to return on invested capital, it's still at the high end of the group. Exxon looks cheap today, but I don't expect that to last as investors realize that this industry stalwart continues to perform at the top of its game. Tyler Crowe (Transocean): Even though the oil and gas industry has been slowly recovering over the past year or so, much of the recovery has happened in North American shale. At current prices, companies can at least break even, and in some cases make a respectable return. This has spurred an uptick in spending for land drilling, and all the associated services and equipment for this particular part of the market. Outside land drilling, there hasn't been much progress. Even though some companies are learning how to develop offshore sources for less money and faster than ever before, offshore fields still tie up lots of capital over several years -- money that could go to projects that can return capital much faster. As much as this trend has held for a few years, chances are it won't last forever. The North American shale industry can't singlehandedly offset global production decline and underinvestment. Eventually, producers will find a price range where spending on offshore developments is once again lucrative. When that time comes, Transocean will be one of the companies producers turn to for an offshore drilling rig. Throughout this downturn in offshore activity, the company has undertaken an incredible fleet turnover program to shed itself of older, less capable rigs. As a result, a vast majority of Transocean's fleet is designed to handle either the deepest drilling waters or the harsh environments of the North Sea and Arctic regions. These rigs command higher service rates and higher margins, and Transocean has a lot of them ready to deploy --and the balance sheet to ride out the middle to late innings of this industry downturn. What makes Transocean's stock so compelling is the fact that it trades so cheap. At a price-to-tangible-book-value ratio of only 0.3, the market is pricing shares for pennies on the dollar of its underlying assets. Wall Street's fear here is that the anticipated recovery may never materialize. That isn't inconceivable, but the possible returns that would come from a recovery make this a high-reward stock worth a deeper dive.